Next→Sitting Or Standing: Which Way Should You Practice Guitar? Looking At The Guitar While Playing: Is It Bad? No. Many people do it. Worrying about these sorts of things is distracting you from things you really need to focus on. This is a “problem” that, for most people, is imaginary. Although it is not bad to look at your hands or the guitar while you play, in the long term you do want to be able to play without looking at the guitar. One reason is that this habit may affect you negatively in a performance or other situation where lighting is not good. 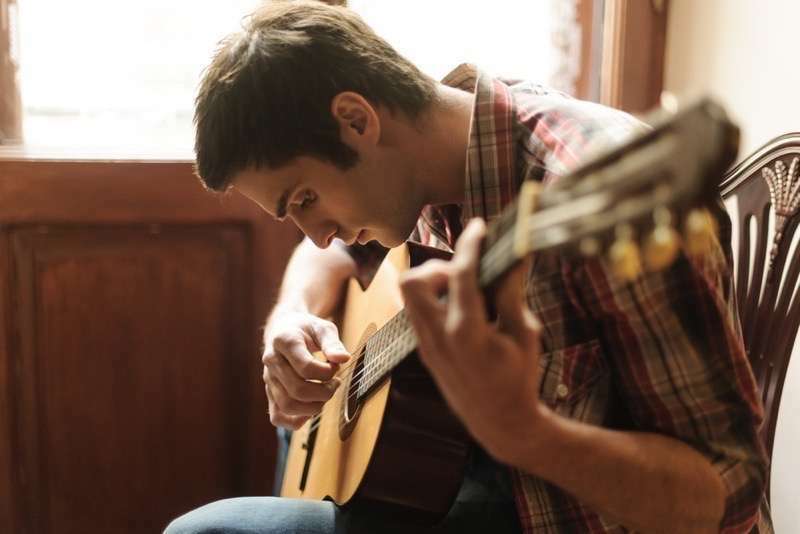 However, it is probably not necessary to deliberately practice “not looking at the guitar”, unless you have good reason to believe that this habit is holding you back in some way. Most players eventually learn to play many parts without looking at the guitar. However, many will look at the guitar especially when there is a position shift. A position shift happens whenever your fretting hand is moving up or down the neck, as opposed to staying in one area. Which hand are you looking at, anyway? Looking at the guitar will tend to help the hand you are looking at to be a little more accurate. If you tend to look only at one hand, that hand will perform better. Favoring one hand can result in a coordination imbalance. There’s nothing wrong with having a coordination imbalance! It means one of your hands is better than the other. That means you’re looking at an excellent opportunity for improvement—if you start paying more attention to the weak hand. Since playing the guitar is a matter of close coordination between the two hands, you want to make sure that you’re not unknowingly dedicating your attention to your favorite hand. Many players have the habit of looking at their fretting-hand, which can cause picking-hand technique to suffer. This especially affects pick-style playing. The cure for this is to learn a complex picking tune. Memorize it, play it from memory, and don’t look at the fret hand at all. Now you can play through the whole piece while looking at the picking hand. You might be surprised at what you find out after a few hundred hours of practice while looking at the other hand. Bending your neck down to look at the guitar neck can cause postural problems in your entire back. It can make your body take an unnatural “C” shape. It is possible that this could eventually cause pain and even injury, although somewhat unlikely unless you are logging quite a few practice hours. See this article on preventing guitar injuries for more information. Tilt the lower part of the guitar body outward a bit. This will give you an easier angle to see the neck of the guitar. Wear a strap, which can help you to bring the guitar a little bit closer to your face. Try practicing with your eyes closed, especially scales and chords that can be played in a single position. This may also help you to improve your memory. There are some reasons supporting the idea that we should practice while looking at a different hand, or with our eyes closed. But for most learners this question is better replaced with other, more pressing concerns. However, if you feel this is limiting you, you can try to improve your ability to play without looking by keeping your eyes closed or even wearing a blindfold. Next articles lesson: Sitting Or Standing: Which Way Should You Practice Guitar?